Very sharp. Not as 'human' as Alex's figs, but definitely a must-have! I think the 3D figures will look awsome when finished. The figures are now sent to the printing company and in 1-2 weeks I should have the masters, if they turn out as expected I will sent to the metal caster. ... well, I don't change my opinion: very clean and a kind of beauty, but they need some human touch... sorry! For me it's the same that Star Wars IV V VI and I II III with Joda in 3d! Yes, Alex figures are better then these 3D figures, but anyway... the 3D models are looking great! And it is at least a great way to do shields and helmets etc. The helmet of the 3D knight looks just awsome! Here are two more initial 3D models and helmets, still a lot of work but this is first impression. They look impressive, but there is still something 'unnatural' to them. Looking forward to see the progress. Well I just reduced the prices at Shapeways Valdemar shop so now all who have the interest can buy 3D printed 1/72 scale knights. Soon these will be available in metal at Fredericus Rex. 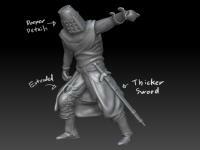 Here you can see the latest knight in the 3D series, what do you think? They look impressive, but there is still something 'unnatural' to them. I agree..there´s just something not quite..er.."realistic" about them, but what it is....????? I think it is the end of the knight´s coat... it looks too thick and smooth. The rest is great, in my opinion!